Think adding another country besides Costa Rica in your trip to Central America would take too much time? Not with our Caribbean Shuttles connecting Bocas Del Toro and Puerto Viejo! Literally, in less time than it takes to drive from San Jose or Puerto Viejo to Arenal, our Caribbean shuttles can transport you to the Bocas Del Toro and your next adventure in Panama! Colorful and utterly Caribbean, this town of clapboard houses was built by the United Fruit Company in the early 20th century. Today, Bocas is a relaxed community of West Indians, Latinos and resident gringos with a friendly atmosphere that easily rubs off on visitors. The allure of Bocas is simply slowing down and soaking up the Caribbean vibes. In fact, travelers to this island town in Panama have a reputation for canceling future plans – it's an easy place to get stuck and an even easier place to linger. Aside from chilling, Bocas serves as a convenient base for exploring Panama's archipelago. Snorkeling and scuba diving are the top attractions in Bocas as well as island hopping and wildlife viewing in some of Panama's most incredible marine reserves. If you are looking for a party scene, Bocas Town is a hot spot for some of the best party hostels in all of Central America. Caribbean shuttles to Bocas Del Toro depart from both San Jose and Puerto Viejo. San Jose to Bocas del Toro shuttles even include lunch and a break in Puerto Viejo so you can get a taste of Costa Rica's Caribbean coast even if you choose not to vacation in Costa Rica. Choose from our selection of discounted Bocas Del Toro Shuttle options below and get started on your adventures in Panama today! This shuttle includes, pick up at your hotel in Puerto Viejo or Cahuita, a guide to help you cross the border and boat transportation to the Bocas Marine Tours dock on Main street in the heart of Bocas Town. Departures at 7:30 am & 12 noon. Costa Rica to Panama Shuttle deposit is $10.00 per Adult and $5.00 per Child. Includes: Boat from Bocas, transportation in an air-conditioned shuttle van, guide to help you cross the border, lunch at Banana Azul in Puerto Viejo, and drop off at your hotel in downtown San Jose or the airport. Costa Rica to Panama Shuttle deposit is $15.00 per Adult and $10.00 per Child. Duration: 5 hours approx. it depends on traffic. Puerto Viejo to San Jose Shuttle deposit is $8.00 per Adult and $4.00 per Child. 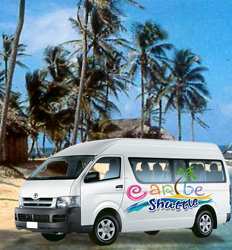 Looking for shuttles to other destinations in Costa Rica? 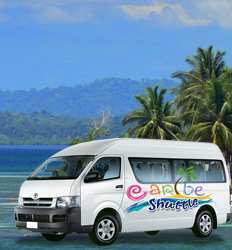 Check out our super saver Costa Rica shuttles!